The practice of prayer appeals to something deep within many of us, especially those of us who grew up reciting Catholic prayers on a rosary, or those of us fascinated by the mala beads carried by Buddhist practioners. But what if our journey has taken a path different from the traditional religions and the often moving rituals they provide? How, and why, should we pray? 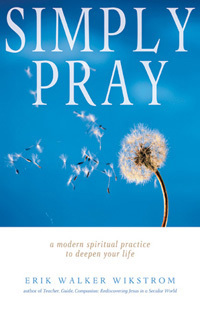 In Simply Pray, Erik Walker Wikstrom reveals the universal qualities of prayer and offers a way to incorporate this spiritual practice into your personal journey. The first two sections of Simply Pray unravel the meaning and practices of prayer within world religions and consider how these ideas are relevant to the individual. The third section, Making a Practice of Prayer, describes how to make your own set of prayer beads and begin to use them. The fourth section, Pray Like This, insightfully translates traditional prayers, such as the Lord's Prayer, into fresh new language, demonstrating how the practice of prayer may be shaped for your individual needs. This is a wonderful guide for all of us who want to integrate our personal beliefs with the practices we enjoyed as children or who want to enliven our spiritual practices with something new. Click here for Erik Walker Wikstrom's blog, "A Minister's Musings". If you long to connect with the Sacred, if you desire to live a life that is more in touch with the Holy, stop listening for something and start simply listening. If you have given up on an anthropomophic deity--the old white guy with the long white beard, or any of his stand-ins--yet can't figure out what to put in its place, stop looking for something and start simply looking around you. Notice those places in your life where you have felt yourself in the presence of the Holy, remember those experiences in which you have heard your connectedness; seek in your own life--your own feelings, your own moments--those places where you have encountered, or are encountering, the Sacred. In other words, simply pray. Pray without any preconceived notion of what you're doing or why. Simply do it, and see what happens. After you pray, then begin to think. Think about what your experiences tell you about the holy. Think about what those experiences tell you about the way the world works and the spirit moves. Build your theology on your experience, rather than the other way around. Define the divine for yourself through your own experiences rather than seeking experiences that match someone else's definition. "Simply Pray is an excellent and much needed bridge for people who struggle with a way to pray that is authentic to them and their sense of the Holy. Not only does Wikstrom help readers to understand the four fundamental forms of prayer shared by all major religions but he offers a practical new form of prayer based on a modern use of prayer beads. A great many people realize that they need a fresh, steady spiritual practice and an understanding that opens their larger being to the Sacred amidst cultural pressures. This book goes a long way toward feeding the hunger of such people with a nourishing spiritual feast. You will not be disappointed in the practical yet deep wisdom drawn from the world's faith traditions found throughout its pages." "Wikstrom writes about a topic as slippery and elusive as prayer in a style that is both clear and accessible, while maintaining a profound sense of mystery. His guidance is at once down to earth and deeply wise, and his tone both serious and tinged with a sense of well rooted humor bubbling just under the surface."